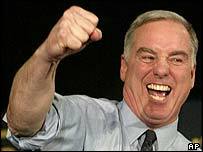 An exuberant yelp by Democrat White House hopeful Howard Dean has become an unlikely web hit. Bloggers sampled the former Vermont governor's high-octane speech to backers in Iowa and added a dance beat. "It had to be done," wrote Jonathan Barlow on his site, one of several to feature versions of the "Dean scream". Observers say the exclamation may harm Mr Dean's chances of becoming the party nominee, but web pages have been overloaded by demand for the tracks. A student's "Dean Goes Nuts Remix" proved so popular on his college magazine's website that it is no longer available because of bandwidth limits. Mr Barlow has halted other content on his site until demand subsides for his version of Mr Dean's address. The presidential hopeful rallies supporters disappointed by his third-place in the Iowa caucuses by listing states where he said he would win, ending by shouting: "And then we're going to Washington, DC, to take back the White House! Yeeaarrgghh!" Mr Dean's outburst on Martin Luther King Day has been dubbed his "I have a scream" speech. It has become a source of comedy for late-night talk shows as well as Mr Dean's rivals for the Democratic Party nomination to challenge George W Bush in the November presidential election. Even his wife Judy told an interviewer it "looked kind of silly". Mr Dean, who says his voice is hoarse because of a cold not his Iowa "whooping and hollering", has been unrepentant. "We did have a little fun in Iowa. I thought I owed it to the 3,500 kids that came out and worked for us," he said during Thursday's candidate debate in New Hampshire.